Randy A. Graves, D.Sc. 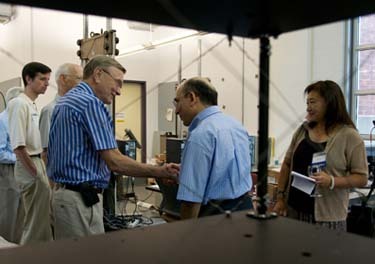 '78 and chair of SEAS National Advisory Council, speaks with Dr. Manzari, chair, GW Department of Civil and Environmental Engineering and director of the Earthquake Engineering and Structures Laboratory (Photo by Eleanor Kaufman Photography). Over 100 alumni, faculty, staff, and students from the School of Engineering and Applied Science (SEAS), along with members of the school’s National Advisory Council (NAC), gathered on August 16, 2012 at GW’s Virginia Science & Technology Campus (VSTC) for the fourth annual summer barbeque. The event, organized by SEAS, serves to engage their alumni in the DC metropolitan area with the SEAS National Advisory Council, through an evening of networking and a showcase of key research laboratories. SEAS Dean David Dolling provided brief remarks focusing on what he calls a significant transformation taking place within the School of Engineering & Applied Science. Since 2008 SEAS has hired 37 key new faculty members, including six this fall, which are invigorating the faculty profile and expanding the school’s capabilities in the classroom and the research laboratories. Additionally, this year’s incoming class of more than 220 freshmen is a new school record and SEAS continues to have a higher than average female/male student ratio. Dean Dolling also spoke about his excitement for the new Science and Engineering Hall (SEH). Currently under construction, the SEH is slated to open in early 2015 at the university’s main Campus in Washington, DC. The SEH will create a hub of science and engineering discovery fostering knowledge creation to tackle the critical challenges facing our nation and our world. More information about the SEH. The annual summer barbeque hosted at the VSTC has become an extremely popular event and the backdrop of the Northern Virginia technology corridor speaks to the transformation the school is currently undergoing. SEAS alumni are invited to more than 300 social, educational, cultural, networking, and athletic events and programs annually. Visit the alumni programs website for information about upcoming events, the SEAS website for complete information about the school, or the website for the Virginia Science & Technology Campus.